A more recent Christmas Eve tradition in Germany is fondu, both Cheese Fondue and Meat Fondue. 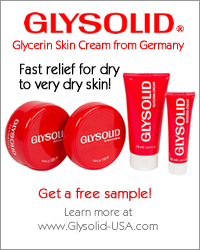 In a Cheese Fondue, a variety of cheeses are melted with spices and wine. Guests dip bread cubes into the melted cheese mixture. 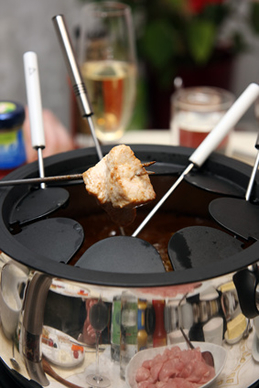 Meat fondue is the most popular kind of fondue in Germany. Small cubes of raw meat are placed onto long fondue forks and dunked into hot oil or broth until cooked. The cooked meat is dipped into various flavorful sauces before eating. A fondue meal can last for hours, which makes it a great way for friends and family to spend a quality Christmas Eve together. You will need a fondue pot with several fondue forks. Please follow the instructions of your fondue pot on how to use it. For the meat, select good pieces of meat - choose a combination of Pork, Beef, and/or Veal. Calculate about 1/4-1/2 pound of meat per person. Cut the meat into small, bite-sized cubes. Fill the fondue pot with a good frying oil, one that doesn't burn when it gets too hot. Peanut oil, safflower oil, sunflower oil, and canola oil will work well. Peel and finely chop the onions and garlic. Add the butter to a large cooking pot. Sautee onions and garlic for a few minutes. Add wine and continue to cook until onions and garlic are soft. Add remaining ingredients. Bring to a simmer and allow to simmer for 10 minutes. Pour mixture through a sieve and add to the fondue pot. Here are some sauces to accompany the meat fondue. Its best to make these sauces a few hours ahead of time so that the flavors can intensify. Combine all ingredients. For a more intense dill flavor, add additional teaspoons of finely chopped dill. This sauce tastes best if the ingredients are allowed to "marry" for a few hours before eating. Whip milk and cream cheese with a fork until creamy. Mix in remaining ingredients. Whip the whipping cream until stiff. Fold in the remaining ingredients.